No gas balloons needed. Image of taxi driver and cab taken in Trondheim, Norway in 1917. In September Norwegians swung strongly for electric vehicles and gave zero-emission vehicles a 45% market share, says Advisory Council of Veitrafikken AS (in Norwegian). There were 4,810 passenger plug-in cars registered in Norway last month, up 25% from a year ago. With more electric vehicles sold, average CO2 emissions per vehicle declined to 55 g/km, a 21% drop from a year ago. Consumers appear to trust all-electric vehicles. Hybrid car sales declined 34% from a year ago and only sold 2,779 units. Major car manufacturers are all rushing into the electric vehicle space. Mercedes Benz invested $12 billion in the space, says Bloomberg, and will be introducing luxury plug-in SUVs and passenger cars. Norway matches broader trends in the auto industry. New car sales are swinging to electric, reports Bloomberg. Creative commons image of taxi driver and his cab courtesy of Municipal Archives of Trondheim. 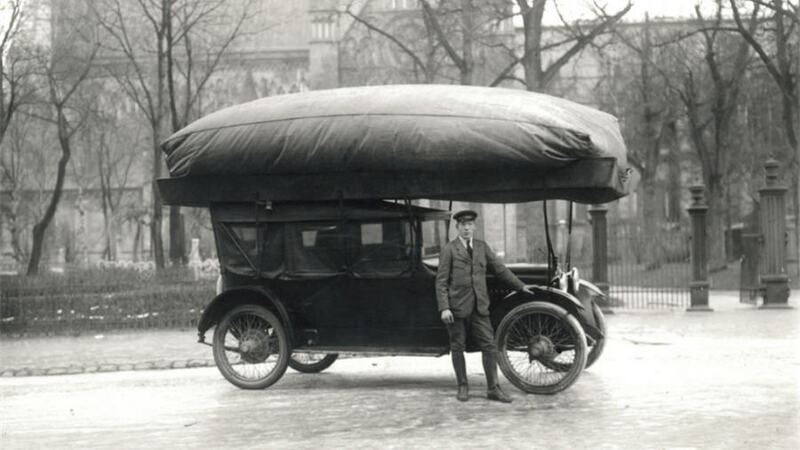 The "ballon" on the roof is a container for gas, which was used instead of petrol during WWI and a couple of years later. Cabdriver is car owner Isak Garmo.